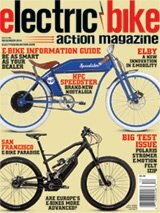 Our own Troy Templin, editor of Road Bike Action magazine, raced in the electric bike race at Cross Vegas, an annual racing event in Las Vegas that coincides with Interbike, the big North American bicycle convention and expo. The event started as a cyclocross event, but they’ve added an electric bike race. For those who think this race is easy, Templin says his heart rate was up over 200 during the race. He’s an incredibly strong rider, once doing a 10-mile electric mountain bike fun race where he barely used the motor, instead going 23-24mph, winning the race and bringing the bike back with the battery at 100% (virtually unused). He placed an impressive 4th place, even using a Euro-spec Focus (European standards limit the bikes to 25 k/h or 15.5 mph) against a field of American-spec class 1 bikes (their motors stop assisting over 20 mph). There’s a tough sand pit and you can see and hear in the video, camera mounted on Troy’s helmet, just how long and brutal the race really is. Racing seems to be becoming more popular, as the weekend before saw the first in the Troy Lee “Electric Boogaloo” eMTB race during the Kamikaze Games in Mammoth Lakes, California.